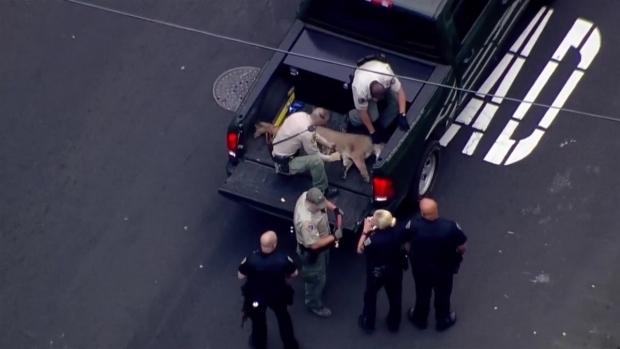 A mountain lion that was on the loose in San Mateo was captured by police and California Department of Fish and Wildlife officials late Monday. The mountain lion was sighted three times in a residential area three times earlier in the day. Officers and Fish and Wildlife officials located the big cat in a residential backyard near 9th Avenue and El Camino Real at about 7 p.m.
After being hit with a tranquilizer dart the mountain lion fled a brief distance into some nearby bushes. At 7:30 p.m., the mountain lion was picked up by three officers, who put the animal in a pickup truck. 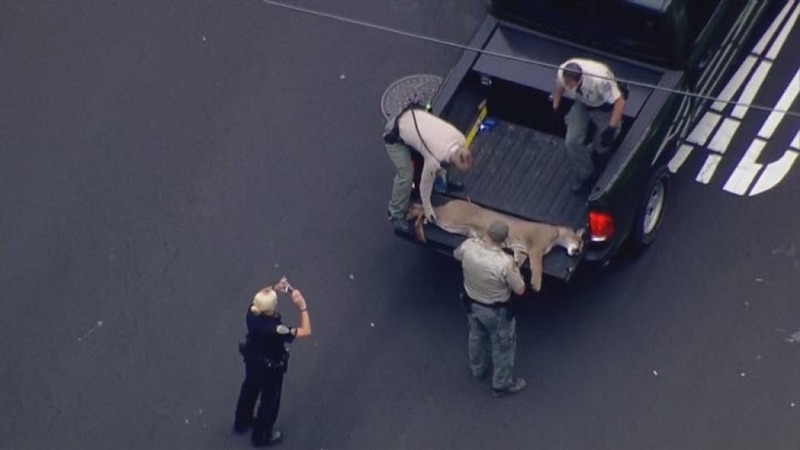 Raw footage from the NBC Bay Area helicopter showing the California Department of Fish and Wildlife capturing and transporting a mountain lion that was on the loose in San Mate on Monday, May 18, 2015. CDFW officials said the mountain lion late Monday was released back to its original habitat. After two mountain lion sightings earlier in the day, a third call came in about 4:30 p.m. to report a sighting on a street near South El Camino Real, a spokesman from CDFW said. "This is a lion that's afraid and all it wants to do is get away," said Andrew Hughan of the CDFW. "We don't know what we're going to do yet." Earlier in the day, employees of a San Mateo Catholic school were put on notice as police responded to a series of mountain lion sightings in the Peninsula city. A San Mateo resident called police to notify authorities of an apparent mountain lion in the vicinity of Hayward Avenue and South El Camino Real at about 1:20 p.m. As a precaution, San Mateo police “personally notified” the staff at St. Matthew Catholic School, 910 S. El Camino Real. A few hours later, about 5 p.m., a third sighting: Authorities said a mountain lion was spotted on the loose near downtown San Mateo. Several neighborhood streets were blocked off as officers looked for the animal. Authorities are reminding residents not to feed wild animals and to avoid approaching mountain lions. Most mountain lions will attempt to avoid confrontation, authorities said. Authorities say, if you do run into a mountain lion, don’t run. Instead, face the animal, make noise and try to look bigger by waving your arms; throw rocks or other objects. Bay City News and Associated Press contributed to this report.